Summer might be almost over (what do you mean it never started? ), and the nights drawing in, but the UK’s biggest resort has a last fling up its sleeve. It’s Illuminations time in Blackpool – the six-mile-long festival of lights along the seafront that proud locals bill as the “greatest free show on earth”. From cartoon characters to royal tableaux, street art to strobes, Teddy Bears’ Picnic to Haunted House, the Illuminations are brash and brilliant in equal measure, and if you’ve never taken a stroll or a drive up the Golden Mile under the lights, you don’t know what you’re missing. They started in earnest in 1912 (making this the centenary year), though “artificial sunshine” lights were first used in the resort as early as 1879. This year, as ever, it’s big business for Blackpool, which – by the simple matter of powering-up over a million decorative lamps – cleverly manages to extend its season right into the autumn, attracting another 3.5 million visitors by the time Bonfire Night comes round. The big switch-on, as it’s known, took place at its traditional time, the Friday night following August bank holiday Monday (August 31 this year), when 20,000 revellers jammed the new Tower Festival Headland in front of the Blackpool Tower. A raft of Team GB Olympic medallists were on hand to do the honours, with music by Lemar, Little Mix, Scouting for Girls and others (we salute you Rick Astley!). The switch-on is a tradition in its own right, with a long list of celebrities called on over the years, from TV casts (Dad's Army, Doctor Who) to pop stars (Geri Halliwell, Robbie Williams) and DJs (Chris Evans, Tony Blackburn); in 1977, even a horse (Red Rum) got in on the act. Once the lights are on, they stay on every night for a very specific 66 days, which means that you’ve got until 4 November to experience Blackpool’s “Northern Lights” in all their glory. The whole display has been given an extra special polish by no less than Laurence Llewelyn-Bowen, whose Diamond Jubilee Tableau is a new feature for 2012. And here at Cool Places, we’re launching our new Blackpool guide later this month to help you get the most out of a visit to the Illuminations – here's a taster of our take on the UK’s favourite resort, from world-class Pleasure Beach to iconic Blackpool Tower. 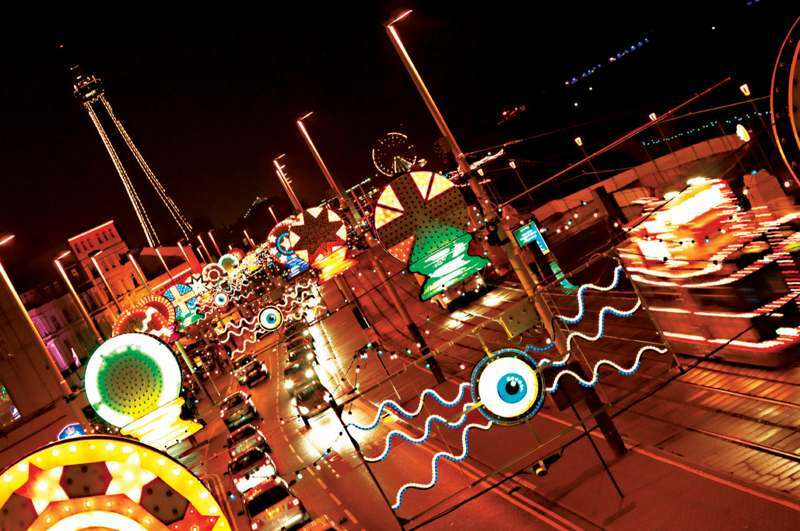 Blackpool Illuminations run until 4 November, 2012. For more information, see the Blackpool visitor information website . Images courtesy of Visit Blackpool.